Congratulations to the Time.com on the launch of their new video experience. It looks and feels different than a standard Flash-centric player, and allowed for some truly custom features. 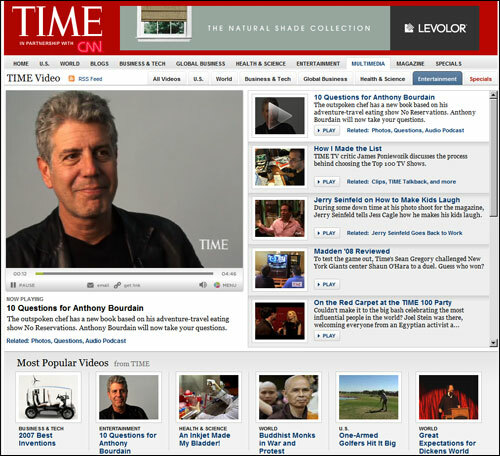 In addition to a unique design, these include a strip of featured videos below the main playback area, a highlighted "Specials" tab (in red), and synced ads in the page and over the navigation area. We expect to see a lot of new experiences like this, fresh new takes on video players that allow for different styles of interaction and are more SEO-friendly. Most importantly, the content is fantastic. I love the Bourdain interview and look forward to the upcoming Person of the Year announcement. We're gratified by the early response from the Time.com team.